Recently, because I have absolutely no patience to wait for grass to grow, I made a quick and easy Live Grass Centerpiece For Spring. The affordability and immediate gratification of this project were right up my alley. I love the way it turned out so much; I thought I’d build this year’s Easter table around it. 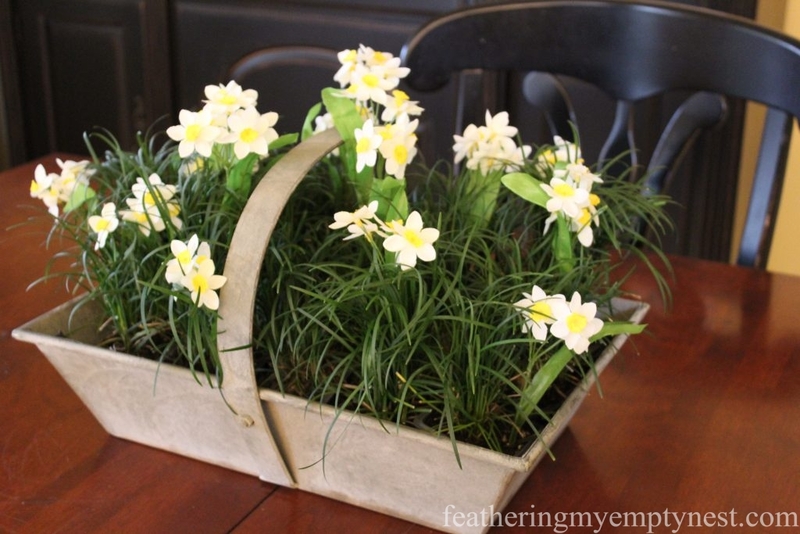 I think the galvanized basket and natural look of the Narcissus nestled in among the grasses, give the centerpiece a simple farmhouse look. 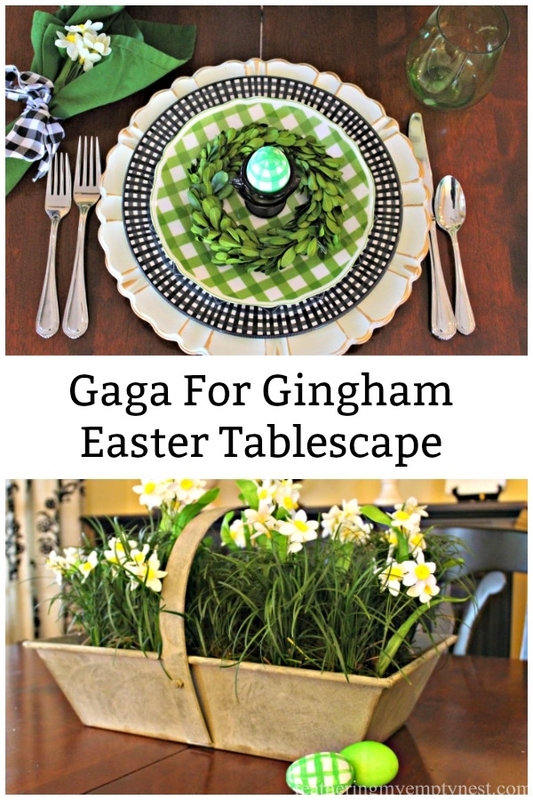 So, this got me thinking about what else I could include in a farmhouse tablescape. Ever since I saw quintessential-farm-girl, Dorothy Gale, in that blue gingham dress in The Wizard of Oz, nothing says “country” to me more than gingham. 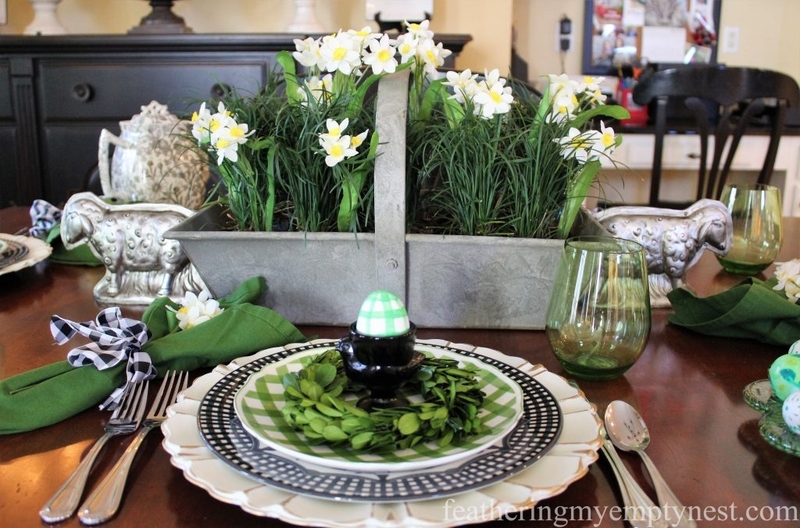 With this in mind, I decided to use the simple plaid pattern and my live grass centerpiece to set a Fresh Fun Farmhouse Easter Table. You can tell by the design of my blog that I am a big fan of gingham, but I’ve noticed that gingham is particularly hot for Spring this year. 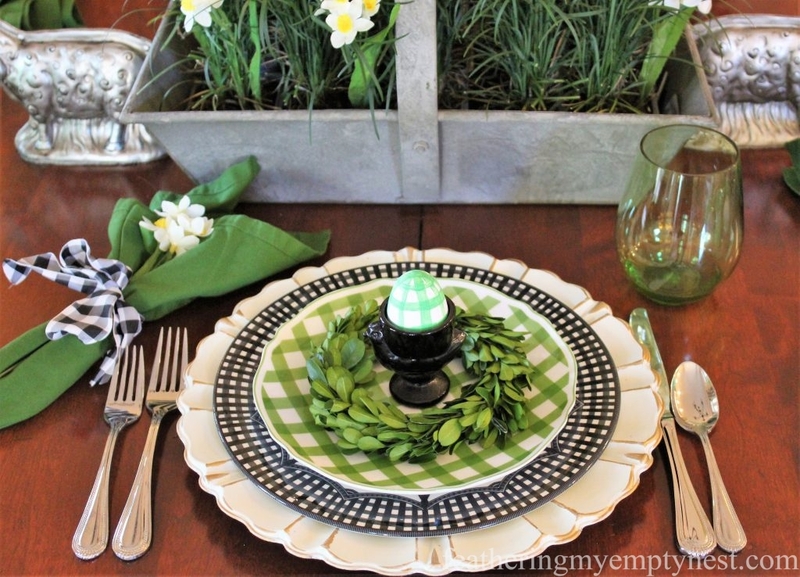 Pottery Barn, Martha Stewart, Williams Sonoma, and Sur La Table are all featuring checkered plates in their Easter collections. 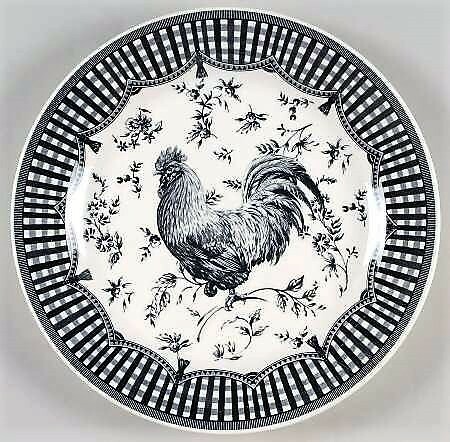 I already had these fabulous Rooster gingham-bordered plates, but I hesitated to use them on my Easter table because they are black. While black may be chic for a cocktail dress, it doesn’t exactly scream Easter, which is typically associated with pastels or bright candy-colored hues. However, since my breakfast room decor includes a lot of black elements, I figured the black gingham tableware would tie in with the room. I also thought the black plates would work for Easter if I combined them with a bright Spring green. 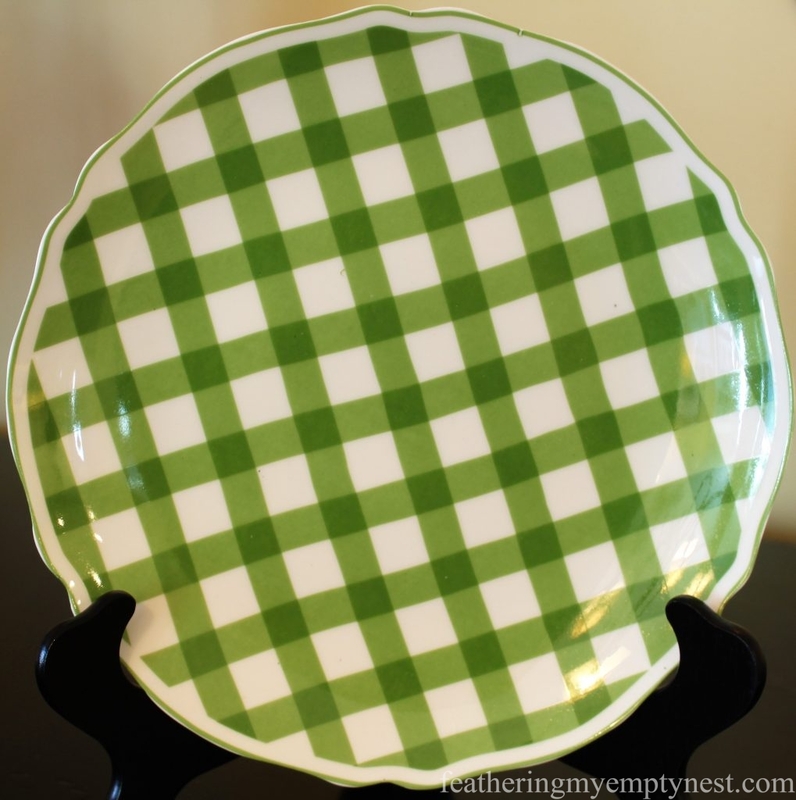 After looking around quite a bit for something to go with the black gingham plates, I ultimately bought these green gingham salad plates at Michaels, which incidentally, were a fraction of the cost of some of the others I had identified. I like the decorative scalloped edge, and I think that the larger scale of the gingham mixes well with the smaller-scale pattern on the black dinner plates. I decided to forgo a tablecloth or placemats. Instead, I used cream charger plates as the foundation for my plate stack because I liked the look of the warm wood tabletop as a backdrop for the cooler green, cream, and black colors of the tablescape. 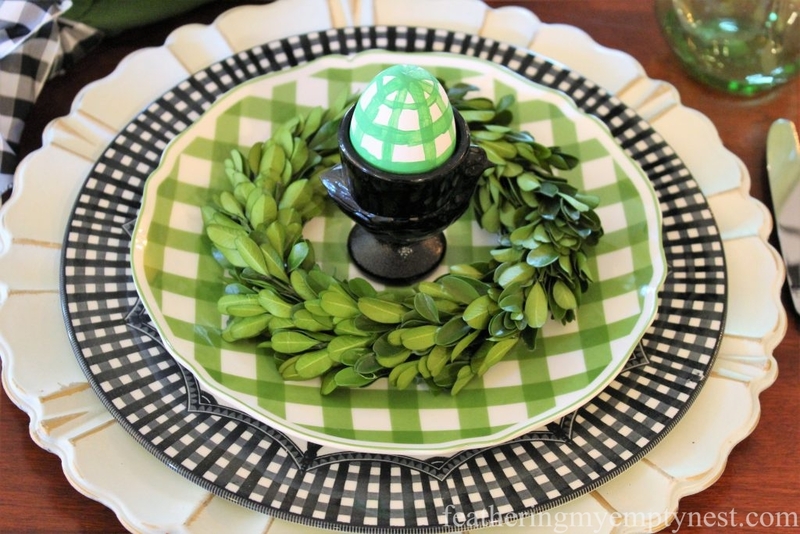 For more farmhouse charm, I placed preserved boxwood wreaths and cute black hen egg cups on top of the salad plates. 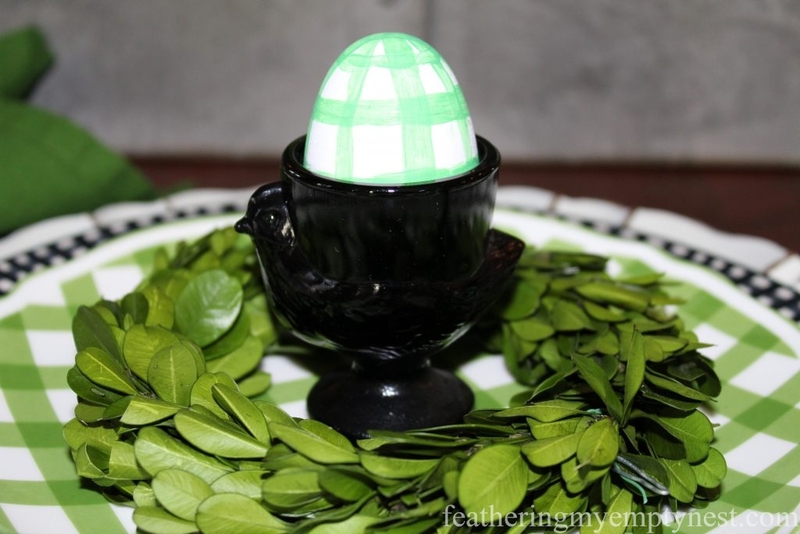 The vintage Luminarc pressed-glass egg cups hold white wooden Easter eggs that I painted with a green plaid design to coordinate with the gingham. 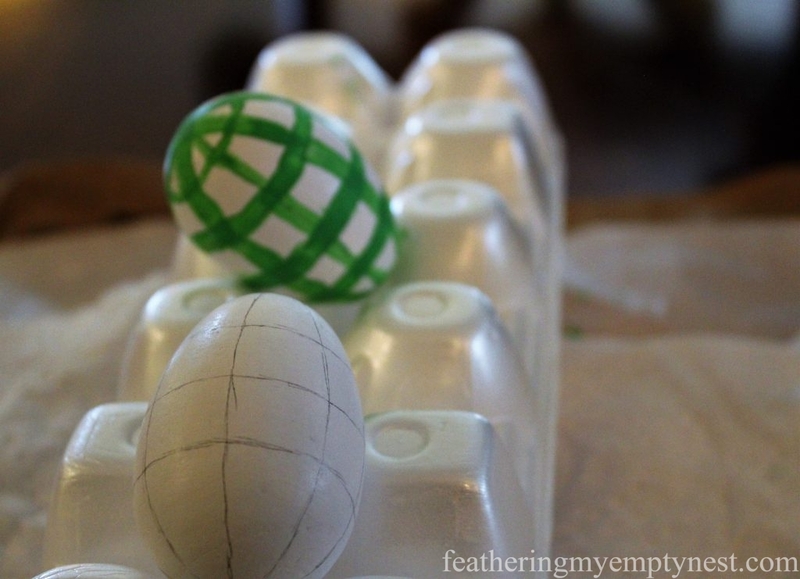 To make the plaid eggs, I first drew the grid for my design on the painted wooden eggs with a pencil. Then, I hand-painted the vertical and horizontal stripes, with green acrylic paint using two different sized paint brushes. The underside of an egg carton helped to stabilize the eggs and to prevent smudging while I painted them. 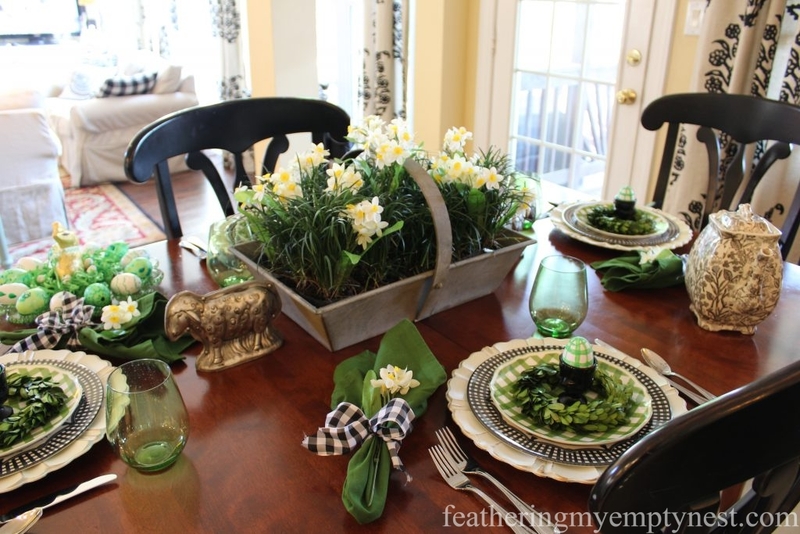 The green napkins are wrapped with black gingham ribbon and are adorned with a single Narcissus stem to tie in with the centerpiece. Green tumblers and beaded stainless flatware complete the place setting. As I mentioned, I had already made the centerpiece as part of my Spring decor. 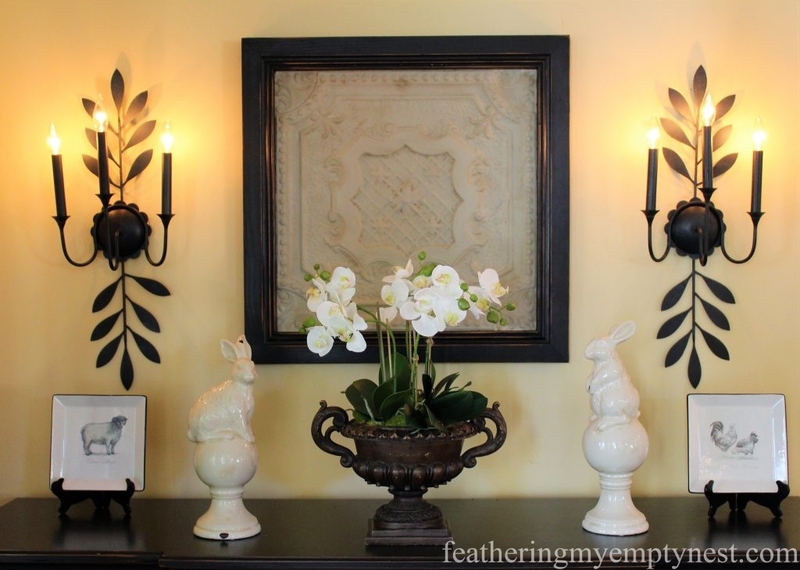 To dress it up for Easter, I flanked it with two vintage-inspired chocolate-mold lambs. (I purchased the lambs from Michaels early in the season but they are no longer available. However, you can easily find vintage lamb cake-molds on both Ebay and Etsy.) I love how these adorable silver lambs look alongside the galvanized basket. Unlike our Christmas and Thanksgiving meals which are always a dinner, our Easter celebration is usually a brunch. 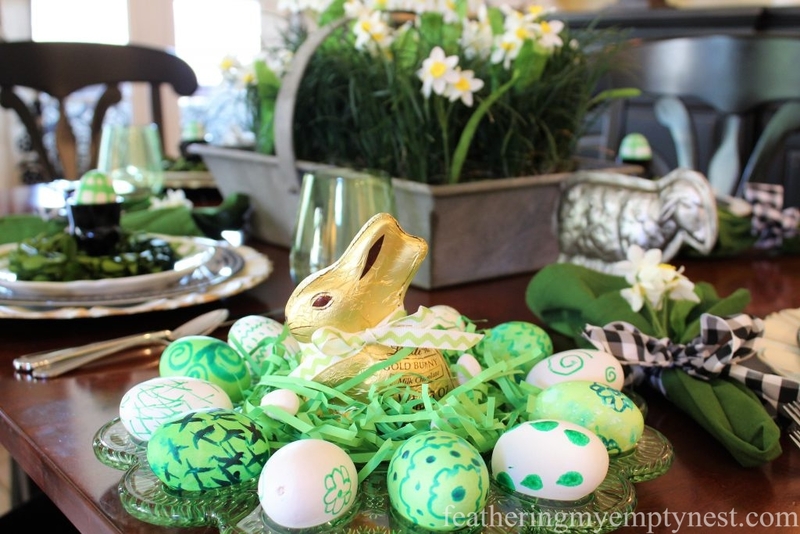 So, in addition to the place settings, I placed A glass egg plate, with more dyed and hand-painted eggs, as well as a chocolate bunny on a nest of Easter grass. The white eggs are wooden and embellished with a paint pen. The green eggs are real and are dyed and then decorated with a “Betty Crocker Easy Writer,” which is an edible food coloring marker. 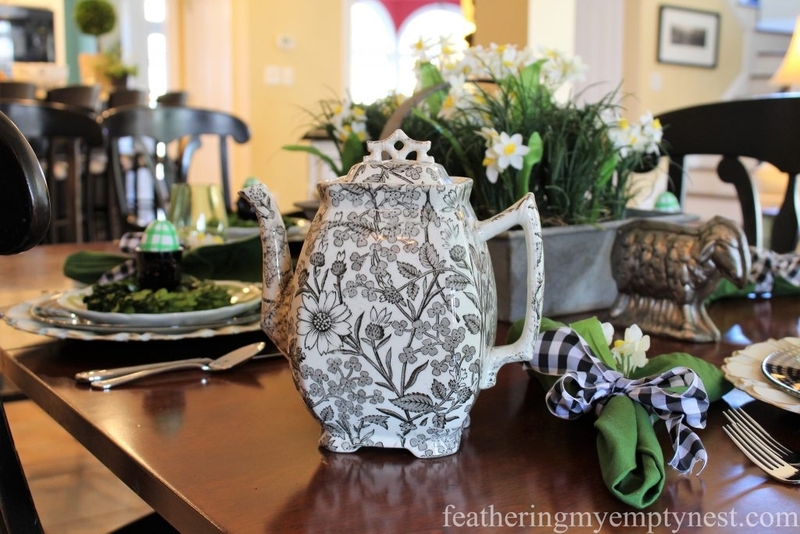 And I also added an antique transferware coffeepot which, because of its all-over black and white country chintz design, fits in well the Farmhouse Easter theme. 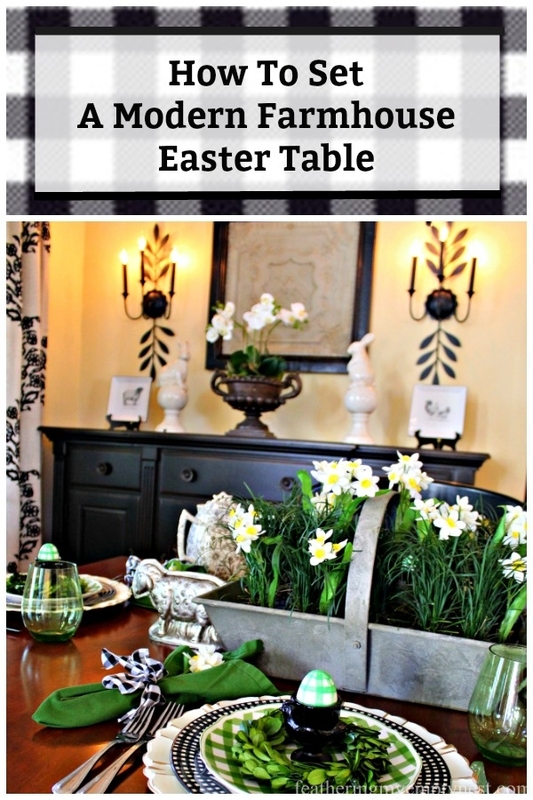 The black items on the Easter farmhouse table coordinate with the black buffet, dining chairs, light fixtures, and drapery fabric in my breakfast room. 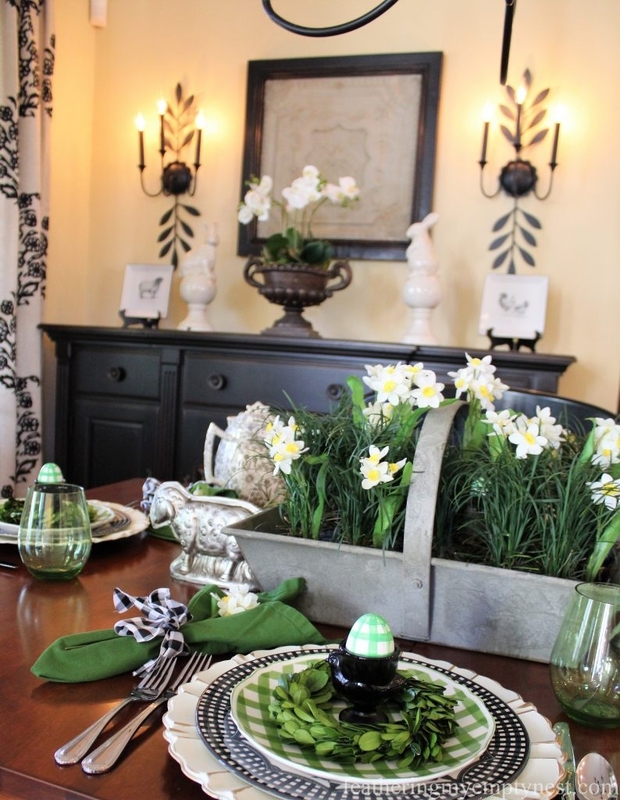 However, despite all the black, the green elements ensure that the table feels fresh, Springlike, and ready for a lovely Easter brunch. A pair of distressed white ceramic bunnies supervises the Easter brunch from their lofty perch on the buffet. I love your post. The black and white with green is beautiful together. The centerpiece is my favorite, it calls for spring. Which is good because it is so confused! Your teapot is to die for! Thank you for all the great ideas. Thanks, Deborah. You are so right about Spring. I feel like I have whiplash here. One day it’s near 80 and the next day it’s snowing! That’s why I am having Spring inside! 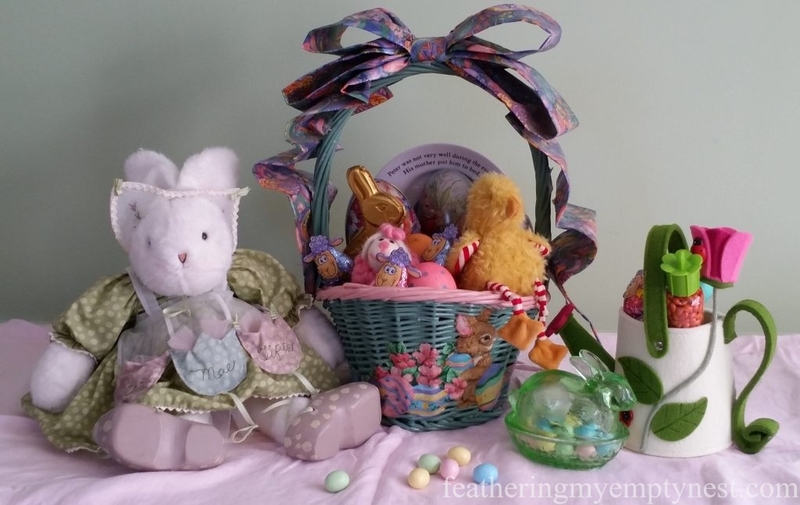 This is such a pretty nod to spring and Easter. 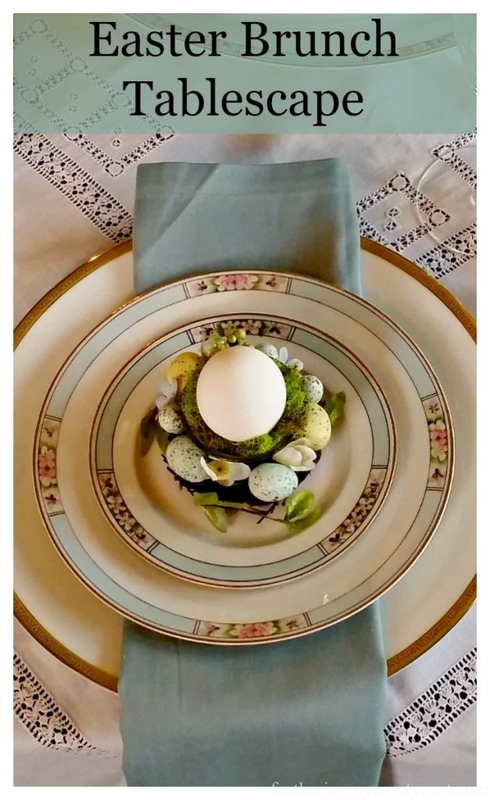 I particularly like the glass egg plate and the decorated eggs. I’ll be lucky if I manage to dye some eggs! Thanks so much, Sandra. We used to dye dozens of eggs when my kids were little. Now, not so much either. I hope you have a happy Easter. This is so fresh and springy! Thank you so much for taking the time to comment I really appreciate it. Happy Easter! Thanks so much for your kind comment. I really appreciate it. Happy Easter! This tablescape is stunning. I really love the contrast between the black and the greens. Beautifully well done. Thanks so much Leanna. I really appreciate your kind comment. 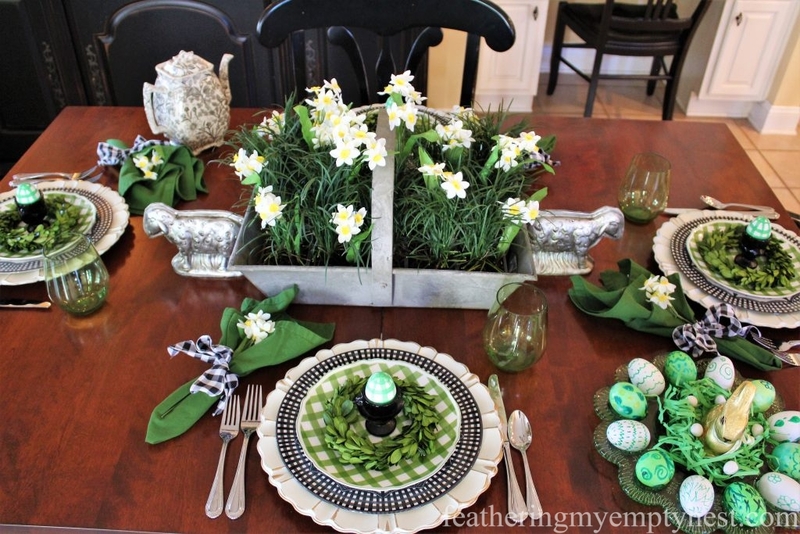 What a creative take on an Easter table! I love the mix of black and green, it has such a fresh look. Your centerpiece is beautiful! Thanks, Pam for your kind comment. Thanks so much Maureen. I really appreciate you taking the to comment. Happy Easter to you too! I love your table setting! It looks like the first breath of spring. So pretty! Thank you for sharing on Party in Your PJ’s. Thanks so much, Teresa, for your kind comment and thanks for hosting Party In Your PJs. What a beautiful table! Love the vibrant greens! Thanks so much, Katherine, for your kind comment. Happy Easter!